filed: August 14, 2014 • U.S. The wind industry is touting increased construction activity and power purchases from some of the country’s largest companies to argue for an extension of its key federal incentive – amid an uncertain political landscape that could be heavily influenced by the outcome of November’s election for control of the Senate. Gridlock on Capitol Hill has so far prevented a renewal of the production tax credit, which expired last year alongside dozens of ostensibly temporary “tax extenders.” While the credit enjoys bipartisan backing, Democrats are more unified in support of the PTC and other clean energy incentives, while resistance has grown among Republicans, fueled partly by critiques leveled from outside conservative groups. The industry has been working to boost its allies in both parties, but an analysis of Senate contributions from the American Wind Energy Association’s political action committee and some of its leading companies shows an emphasis on giving to Democrats up for re-election and far less to Republicans in tough races, according to an analysis of contributions that have been reported so far this cycle. “There’s a concern about the outcome of this year’s elections with regard to the Senate,” said one industry lobbyist, who requested anonymity to speak freely. But industry officials say they do not hesitate to support their champions regardless of party and would not publicly declare a preference for continued Democratic control of the Senate, fearing that doing so would create a self-fulfilling prophesy and hurt their chances of winning a PTC renewal should Republicans take over. Indeed, Sen. Mitch McConnell (R-Ky.), who will become majority leader if he survives a tough race in Kentucky and Republicans flip another six seats, was a top recipient of contributions from some companies that manufacture wind turbines and utilities that have been leading adopters of renewable energy. Sen. Susan Collins (R-Maine), a longtime supporter of renewable energy who faces a relatively easy re-election in November, is also among the industry’s top recipients. And the giving from AWEA’s PAC in House races tilted toward Republicans, who are virtually assured of maintaining their majority in the lower chamber. Whatever the outcome of the election, the same group of lawmakers will return to Washington, D.C., in mid-November or December for a brief “lame duck” session to address unfinished business for the year, which likely will include spending bills and some action on tax extenders. Whether an extenders package includes a PTC renewal remains to be seen, but it is expected to fare better if Democrats are going to remain in the majority than if Republicans could simply run out the clock until they control both chambers of Congress in 2015. Senate Democrats – with the help of key Republicans like Iowa Sen. Charles Grassley – have been the driving force behind efforts to renew the credit. Finance Chairman Ron Wyden (D-Ore.) included it in an extenders bill he introduced earlier this year after it had been left out of a prior bipartisan proposal from Wyden and Utah Sen. Orrin Hatch, the committee’s top Republican. The PTC stayed in the draft when the committee voted down an amendment to strip it 18-6 with five Republicans joining Democrats to support the credit. Data courtesy of a Greenwire analysis of donations from companies representation on AWEA’s board or who donated to AWEA’s PAC this cycle. If the credit is to stand a strong chance to survive, pressure will have to come from the Senate, and PTC supporters expect to enjoy additional leverage if Democrats can maintain their majority. The PTC likely is “the only one … that’s threatened” in the entire extenders package, said Grassley, who attributes the resistance to “a general philosophy that we’ve done too much government picking winners and losers,” which has influenced GOP thinking on a variety of energy issues. “But I don’t know that that’s as strong in the Senate as it is in the House … so they’ve still got that to worry about anyways,” Grassley added in a recent interview. In the House, retiring Ways and Means Chairman Dave Camp (R-Mich.) earlier this year proposed ending the PTC and clawing back some of its earlier promises to wind developers (E&E Daily, March 10). And newly installed House Majority Leader Kevin McCarthy (R-Calif.) opposes the credit despite representing one of the windier districts in the country (Greenwire, June 13). Rep. Kevin Brady (R-Texas), a senior member on the Ways and Means Committee who last year led an energy tax working group, said that negotiations around a lame-duck extenders package have not yet begun in earnest between the two chambers but that he was hopeful some sort of compromise would be reached by year’s end. Numerous PTC phaseout proposals have been floated in the context of comprehensive tax reform, but industry supporters say wind should not lose its long-standing incentive until tax breaks for fossil fuel development that are permanent fixtures in the tax code also are reduced. In releasing the group’s report on activity in the industry over the first six months of this year, AWEA President Tom Kiernan called for immediate passage of the Wyden bill, which would extend the PTC through 2015. “We can double American wind power by 2020, and double again by 2030, if Congress gets the rules straight by extending these critical tax policies as soon as possible and continues to work on long-term policies that would provide a more predictable business environment,” Kiernan said in a statement. “Wind is a very good deal right now for American consumers, and with consistent policies we can build a lot more of it,” he said. AWEA’s second-quarter report showed developers had installed 478 turbines at 15 wind farms through the first six months of this year, an exponential increase over the one turbine installed during the same period of 2013 but still not as much activity as the industry had seen in earlier years. Another 109 projects were still under construction as of June 1, according to the report. Activity is continuing because projects only had to be under construction to qualify for the PTC before it expired at the end of last year, and IRS guidance released yesterday is expected to make even more projects eligible for the credit (Greenwire, Aug. 11). But an additional extension remains a top priority. David Burton, a partner at Akin Gump who is an expert on energy tax issues, predicts the PTC is more likely than not to be extended during a lame-duck session, when the current crop of lawmakers will return to Washington no matter who wins the election. He noted that Wyden has been a vocal supporter of wind, so it would be helpful if he were still chairman of the Senate Finance Committee in the new Congress. He also noted that Grassley has also been a longtime ally of renewable energy. To make its case over the August recess, the industry is arranging tours for lawmakers who have wind farms or manufacturing plants in their states or districts, continuing to tout the jobs created within the industry and running advertisements to thank its champions in Congress. The first series of such ads from AWEA thanked Grassley, Sen. Mark Udall (D-Colo.) and Rep. Bruce Braley (D-Iowa). Udall is battling for re-election against Rep. Cory Gardner (R), who has supported the wind industry in the past but did not lend his name to a bipartisan letter earlier this year urging a PTC extension. Grassley is not on the ballot this year, but Braley, who did sign the PTC letter, is in a tough race for Iowa’s open Senate seat. Udall and Braley also were both among the top recipients of campaign contributions from AWEA and some of its most politically active member companies, while Gardner and Braley’s opponent, state Sen. Joni Ernst (R), were all but ignored by donors from the industry. That is just one example of a pattern of Senate giving that heavily favors Democrats. The party has 21 Senate seats to defend this year, compared to the Republicans’ 15. And all but two of the elections rated by The Cook Political Report as either tossups or trending toward the out-of-power party are currently held by Democrats; the exceptions are McConnell’s re-election and the open seat in Georgia. Greenwire analyzed Federal Election Commission data to isolate contributions to senators and their leadership PACs, Senate candidates, and the Democratic and Republican Senate campaign committees. The analysis considered contributions from WindPAC, the official channel for AWEA’s political spending, as well as contributions from PACs associated with companies that have a representative on the trade association’s board of directors and companies that gave to WindPAC. The analysis included 13 total companies in addition to the AWEA PAC, ranging from developers such as RES Americas and EDF Renewables to utilities such as American Electric Power Company Inc. and Xcel Energy Inc. to manufacturing giants like General Electric Co. and Siemens as well as Wall Street firm JP Morgan. Some of the included companies have larger priorities than a PTC extension; for example, AEP is among the most coal-reliant utilities and is facing a suite of new and impending rules from U.S. EPA that, along with low natural gas prices, are expected to cause numerous coal-fired plants to shut down. And GE and Siemens have varieties of businesses that rely on the government to purchase products or provide policy assistance. The analysis does not capture every contribution from the wind industry, nor does it capture outside spending being organized by billionaires such as Tom Steyer, who plans to raise at least $100 million to help Democrats hold the Senate and defeat Republican governors, or the industrialist Koch brothers, who reportedly raised at least $400 million for conservative causes in the last cycle and remain prolific ahead of this year’s elections. And any partisan tilt from renewable energy firms likely is dwarfed by oil and gas industry contributions, which so far this cycle exceed $31 million and are tilted 78 percent in favor of Republicans, according to the Center for Responsive Politics. Overall, the $1.8 million in analyzed wind-linked contributions to incumbent senators or Senate candidates were split fairly evenly, 53 percent to 47 percent in favor of Democrats. But Democrats facing re-election received nearly $2 for every dollar that went to a Democrat not on the ballot, while contributions to Republicans were more evenly divided between those facing re-election and those who are not. Democrats up for re-election received 33 percent of the industry’s total Senate contributions, compared to 26 percent of contributions that went to Republicans who will be on the ballot. The trend was even more pronounced at the official AWEA PAC, where nearly 80 percent of its more than $92,000 in Senate contributions went to Democrats up for re-election, compared to 6 percent to Republicans running in November. The overall partisan split in Senate giving was 84 percent to 16 percent in favor of Democrats. Along with Collins and Grassley, Sens. Mark Kirk of Illinois and John Thune of South Dakota – who are not on the ballot until 2016 – were the only Senate Republicans receiving contributions, compared to more than a dozen Democrats led by Landrieu, Braley and New Hampshire’s Jeanne Shaheen, each with between $9,000 and $10,000. The partisan emphasis is more pronounced than during the 2012 election cycle, when 55 percent of AWEA’s Senate donations went to on-ballot Democrats and 15 percent went to Republicans up for re-election. The pattern was not reflected in this year’s contributions to the House, where Republicans are a virtual lock to maintain their majority next year. 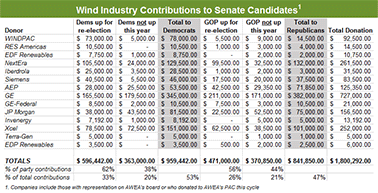 AWEA gave $33,000 to Republican House members or candidates, compared to $22,000 to Democrats. Similar patterns were evident among other companies whose core business is renewable energy development, as opposed to more diversified utilities or manufacturing companies. For example, PACs affiliated with Iberdrola Renewables LLC, the U.S. subsidiary of a Spanish firm, gave $25,000 to Democrats up for re-election compared to $1,000 to a single Republican on the ballot, Maine Sen. Susan Collins, who is among her party’s most moderate members and faces just token opposition in November. The overall winner among candidates who received contributions from AWEA or its affiliated companies was Senate Energy and Natural Resources Chairwoman Mary Landrieu (D-La. ), who received $58,000 in contributions to her campaign or leadership PAC from AWEA and its most active members. Landrieu is in one of the toughest re-election races this year, as is the Democrat with the second-largest haul, Udall, the Colorado senator who received nearly $48,000 in political support from the industry. Embattled Democratic Sens. Kay Hagan of North Carolina, Mark Begich of Alaska, Mark Pryor of Arkansas and Shaheen each received between $24,000 and $39,000 in contributions. Among nonincumbent Democrats, Braley received $27,000, followed by Michigan Rep. Gary Peters, who received $9,000 to aid his run for that state’s open Senate seat, and Georgia Democratic candidate Michelle Nunn, who received $5,000. McConnell received more from the industry than any other Republican, taking in $48,000. His total is followed by the $37,000 donated to Grassley, who authored the first PTC law in 1992 and has long been considered one of the wind industry’s leading congressional champions. He is not up for re-election until 2016. McConnell faces a tough re-election race in November against Kentucky Secretary of State Alison Lundergan Grimes (D), whose only support among the companies analyzed came as a $500 contribution from the PAC of Invenergy, a renewable and natural gas power plant developer. Contributions to McConnell and his leadership PAC came from AEP, GE, JP Morgan, NextEra, Siemens and Xcel. Aside from McConnell, the Republican senators up for re-election who receive the most support are generally running in fairly noncompetitive general election races. Sens. John Cornyn of Texas, James Inhofe of Oklahoma, Lindsey Graham of South Carolina and Collins are among the top 10 Republican recipients, receiving between $25,000 and $30,500 apiece. None faces a tough contest in November, although Cornyn and Graham successfully fended off more conservative primary challengers earlier in the year. Former South Dakota Gov. Mike Rounds (R), who is favored to flip the seat being vacated by retiring Sen. Tim Johnson (D), received $20,000 in contributions from NextEra and Xcel, the most of any nonincumbent Republican. Behind Rounds is Rep. Shelley Moore Capito, who also is favored in her race for the West Virginia Senate seat that Sen. Jay Rockefeller (D) will leave open when he retires. She received $17,500 in contributions from GE and AEP. Among Republicans in tougher races, Rep. Tom Cotton of Arkansas received $14,500 from GE and AEP for his bid to unseat Sen. Mark Pryor (D-Ark.) but that was less than the $24,000 donated to the incumbent from AWEA and the companies represented on its board. Rep. Jack Kingston (R-Ga.) received $11,000 in his unsuccessful campaign for the GOP nomination in Georgia’s open Senate race, more than the $5,000 raised from the industry by Democratic candidate Michelle Nunn. Nunn’s general-election opponent, Republican businessman David Perdue, received no contributions from AWEA or members of its board. Other candidates ignored by the wind industry so far include Louisiana Rep. Bill Cassidy (R), who is running against Landrieu in the fall, and Ernst, the Republican nominee in Iowa’s open Senate race. Braley, Ernst’s opponent, took in $27,000 among the companies Greenwire analyzed, more than any other nonincumbent running for Senate this year. Gardner has also not received much financial support from the industry or its allies for his Colorado race, with one $1,000 check from Xcel going to his congressional campaign after his decision in March to enter the Senate election against Udall. He received an additional $4,000 from Xcel and $1,000 from GE’s federal PAC prior to that announcement.